This entry was posted in animals, Cities, Local News, National Parks, News, Photo of the Day, Uncategorized, wildlife, wolves and tagged black, Field, lamar valley, Photo, Photography, portrait, wolf, yellowstone. Bookmark the permalink. How incredible! Good thing the Grizzly wasn’t running toward you instead of the wolf! Wolves are usually shy and not aggressive, grizzlies, not so much! 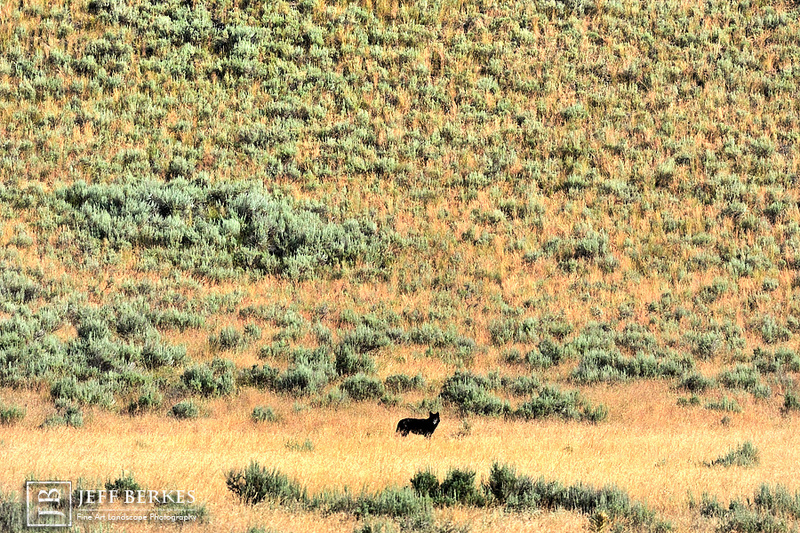 Yellowstone is indeed a magical place- I love the contrast in the picture of the black wolf and the yellow grasses. Picture depicts the “lone wolf” metaphor, black on gold- king of yellowstone! Happy trails! Well put! I don’t think he realized I was there, and when he did, he turned around and left. It took me ten minutes to see something that this group hasn’t seen in 3 days! Love Yellowstone and can’t wait to go back. Glad you had such a great experience! When we went to Yellowstone, with the first 15 minutes after our arrival, I got a picture of what I thought was a wolf! I was so excited – couldn’t wait to show someone! We went to the ranger station and I proudly showed the ranger. He smiled and said in a very nice manner- “sorry to burst your bubble Miss, but that’s not one of our wolves, that’s just a local coyote!” Your wolf is magnificent! WOW – love seeing wildlife in the WILD!!! A life memory! One I’m sure that will be passed down to those who follow you! I had to read it to my husband! His response was Holy Sh-t! that’s a good story! I concur! That memory will no doubt haunt your dreams! Lucky break, I would say! Great shot and live to show it!!! !